This could help us all breathe a little easier. New research may be changing the way scientists study lung disease, idiopathic pulmonary fibrosis, in particular. Previously, doctors would grow two dimensional cultures which could not be effectively used to model certain conditions, such as lung scarring. Even when the cells came from idiopathic pulmonary fibrosis patients, the cells turned out healthy on the flat cultures. To solve this, scientists at the University of California, Los Angeles (UCLA) have grown three-dimensional “organoids” that resemble sections of human lungs instead of just cells. The researchers used stem cells taken from actual adult human lungs to coat tiny sticky hydrogel beads. These eventually grew and self-assembled to envelope the hydrogel beads, which were all placed inside linked wells. The resulting structure produced evenly distributed three-dimensional patterns consistent with actual air sacs like those in human lungs. 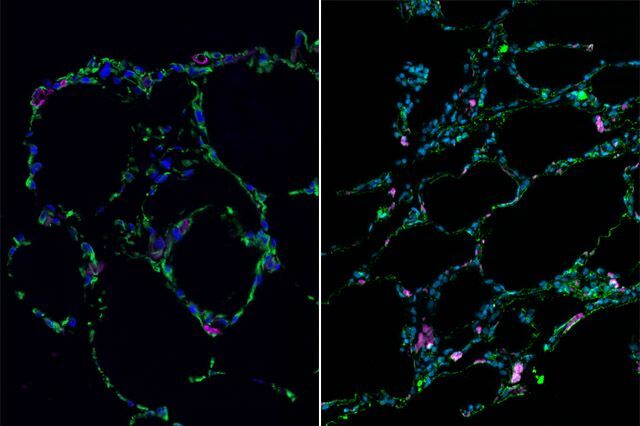 “While we haven’t built a fully functional lung, we’ve been able to take lung cells and place them in the correct geometrical spacing and pattern to mimic a human lung,” says UCLA associate professor of pediatric hematology and oncology and lead author Dr. Brigitte Gomperts. Lab-grown lung-mimicking tissue (left) in comparison with real human lung tissue (right). UCLA Broad Stem Cell Research Center. Remarkably, by adding certain molecular aspects, the lung organoids successfully developed scarring consistent with those in idiopathic pulmonary fibrosis patients, which will help to better study the disease. Despite the technique’s simplicity, its potential applications could tackle diseases that remain complex and difficult to study with current technology. Patients usually die within three to five years of diagnosis, and currently, there is no cure. With this technique, researchers can grow infected lung organoids so they can further study the biology of the disease. They can also conduct various drug experiments to come up with a precise, personalized treatment plan before administering anything to the patient, minimizing risks of damage. It’s also very easy to reproduce: “We can make thousands of reproducible pieces of tissue that resemble lung and contain patient-specific cells,” says materials science and engineering graduate student Dan Wilkinson.